"The app announced in February 2013 that Snapchat users were sending 60 million messages daily." Snapchat developers Evan Spiegel and Reggie Brown never thought they’d one day set their advertising rate at $750,000 a “snap”. The figure was reported by AdWeek earlier this week. The photo messaging application – now synonymous with picture messaging – was originally created by Brown and Spiegel as a project at Stanford University and was initially under the name “Picaboo” back in 2011. One year later, 25 images were being sent per second and by November 2012, users had shared over one billion photos. The app announced in February 2013 that Snapchat users were sending 60 million messages daily and this number significantly grew to 400 million photo messages a day in November later that year. If you were to extrapolate this out to make estimates for the year ahead, the numbers could be quite staggering. Consequently, the instant photo messaging app grew significantly and now the business is asking brands for $750,000 a day to advertise on its social platform. Is the rate worth the return in investment, marketers ask themselves? The messaging app’s rates have been compared with prime time 30 seconds TV ad rates, but the Snapchat ads however are generally less than 10 seconds long and reach a much smaller audience. 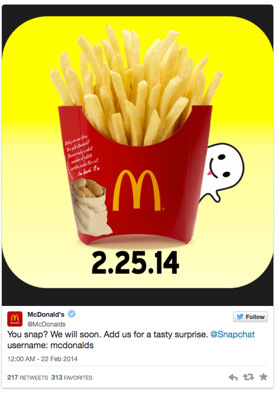 Snapchat only recently started running live ads late last year and since the launch, big brands such as Samsung, McDonald’s, Macy’s and Electronic Arts have included Snapchat in their marketing budget. When the US-based McDonald’s was filming the TV launch of their new sandwich, the American fast food chain invited fans to connect on Snapchat for the chance to see exclusive photos from the marketing shoot. Being a familiar brand, we expect to see big advertising budgets, but giving fans the chance to see real time photos and videos from behind the scenes is a very clever way to engage and give Snapchat users a reason to follow. Besides the steep price, there are still a few issues that are holding a few advertisers back from signing the six figure cheque. According to AdWeek, which got the information from unnamed sources, the app still isn’t equipped to give their clients sufficient information on the breakdown of the advertising. The app isn’t able to tell their clients how men vs women saw an ad and there are no breakouts. And of course, the ads disappear. “It’s very hard for marketers to get their hands around advertising that is so ephemeral,” a source told AdWeek. Snapchat however, believes their rates are completely legitimate given the unique target audience it can offer their clients – teens!